Running, beer and cake – what’s not to like? 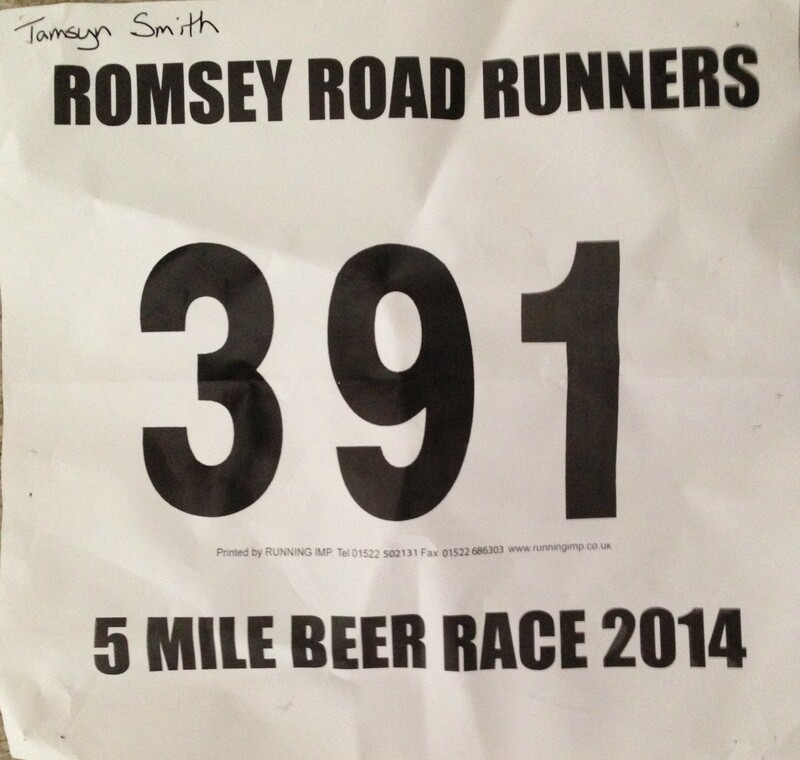 Today was the Braishfield 5 mile beer race, hosted by Romsey Road Runners. I mentioned it last year, as I hadn’t realised it was on and we cycled past it. This year, I expected to miss it again as I was going to do the uninspiring D-Day 10k race in Portsmouth, which is the final race in the HRRL series, but as I missed Alton 10 mile through injury and was too late to enter Netley 10k, I decided that I might as well do the more interesting race. We milled around for a little bit and then Stu went off to do a warm up. I stopped to chat to Pam and Jez for a little bit and then we walked down the road to the race start. My coach told me that he wanted me to run for 1:15 today (including the race). I estimated that it would take me about 45 minutes to complete the race, so I wanted to do a 15 minute warm up and 15 minutes after the race. Unfortunately, there were too many distractions (i.e. people I wanted to talk to), so I didn’t start running immediately, and then only managed to get in 7 1/2 minutes before lining up for the race briefing. The race started in a field, where we had to do one lap, before heading out onto the road. I started somewhere mid-pack, which felt about right. The marshals were very supportive and enthusiastic, with lots of cheering as runners went past. I think this is one of the things that makes the difference between a race organised by a running club and some of the charity events that I’ve taken part in, where the marshals are not runners themselves and therefore have no idea how important their support can be. I ran in the shade as much as possible, but was entirely unprepared for how ‘undulating’ the course would be. It was also an incredibly hot day (reaching over 24°C / 75° F). I always hate running in the sun and knew that it would be tough. At about 2.5 miles, the lead bike went past, closely followed by Andy, a fellow Lordshill Road Runner. He looked very comfortable running in the heat and was able to call out some words of encouragement to me. I then expected some other runners to come past, but the next placed runner, Ben, (another LRR) was nearly 2 minutes behind. I was soooo grateful to get to a water station. I threw a cup of water over my head and then collected a second cup. I tried to drink from it, but struggle to drink from a cup when running, so I ended up throwing most of the second cup over myself as well. At least for the second lap, I knew what lay ahead. Some of the marshals shouted out, ‘Nearly there – not far to go now”… even when running a marathon, over 1.5 miles is a long way to go, in a 5 mile race, it’s a huge distance, but I appreciated the sentiment. The heat really started to take its toll on me and by the time I was on the road heading back to the finish field I was being passed by quite a few runners. Stu and Rob were waiting at the entrance to the field. Stu offered me some water, but I didn’t want to stop for it. I thought I might just about be able to finish ahead of my slowest 5 mile race time, but I didn’t realise that I had to do a lap of the field that was probably 3-400m. Finally, I crossed the line where I was handed a bottle of water and some tokens for a beer (or soft drink) and cake. Pam and Jez were waiting there, so I stopped for a brief chat whilst drinking most of my bottle of water. I then explained that I needed to run for another 20 minutes. I headed off to where my bag was and tucked the tokens and my empty bottle inside before heading back out on the run route in the opposite direction. I ran out for about 9 minutes, calling out encouragement to runners that I passed. I then turned around and headed back to the field for a final time. I had a quick wash off, changed my clothes and went to exchange my tokens. I don’t usually drink alcohol, but didn’t fancy the alternatives (lemonade and Fanta), so I plumped for a pint of bitter shandy, which turned out to be my best decision of the day. I then went to look at the cake stall. There was a huge array of choice, but I was being mindful of how many calories I might be ingesting, so I chose a slice of a delicious ginger cake, which seemed like a relatively low-calorie option in comparison with some of the other treats on offer. I then had the chance to stop and chat to Stu, who had achieved a PB by about 40 seconds, which is really impressive considering the heat and the course. At the time of writing, the official results have not been posted online and I didn’t look at the print outs whilst I was at the race. I think I finished in 46:59, which is about 3:40 slower than my PB and 45 seconds slower than the slowest 5 mile race I’ve done, so it was a PW! Overall, it was a lovely race. I’m sure if it had been raining, lots of people would have complained, but I would have preferred either an earlier start or an overcast day! This race sounds so delicious!! I wish I were there! Don’t be too down about the PW… It happens to the best of us!! Cheers! I’ve realized that small and local races are my favorite, that’s just my style, this one sounds like a fun one! I know what you mean about the earlier start, even half an hour can make a huge difference on a warm day.